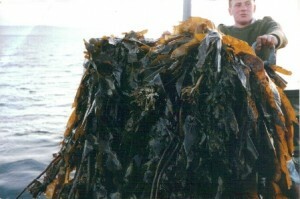 Oceanic Liquid Seaweed Fertilizer is produced from kelp, a seaweed that grows at tremendous rates the world over and can reach lengths of over 50 metres in some areas. The kelp that our fertilizer uses is harvested from the cool waters of the Orkney Islands and is packed with nutrients that help plants attain these extraordinary growth rates. More flowers! Up to 25% more flowers in some cases. Benefits plants during drought and stress through enhancing uptake of nutrients. Better germination of seeds when soaked in liquid seaweed solution. Stimulates root growth in young transplants. How Does Liquid Seaweed Work? Can one product really be so versatile in its action on plants, especially at such low application strengths? Even at low concentrations, the dual action of the liquid seaweed’s phytohormones, cytokinins and betaines, accelerate the building and functioning of a healthy plant when fed along with basic nutrients – N, P, K and trace elements. Cell division, especially root development, often enhancing the root system by over 100%; also flower and fruit set resulting in improvement in crop yields and quality. Cell membranes, thus enhancing uptake of other substances into the plant both through the root and leaves, eg nutrients and fungicides. Of crucial importance is its overall promotion of a strong, healthy plant plus special actions of the betaines maximise resistance to stress from many impacts. When used as a foliar spray it ensures the rapid delivery of key elements to areas of most need, particularly under deficiency stress. Our fertilizer uses sustainable reaping methods to ensure the future of the natural crop. It only harvests the weed when in season and the growing circumstances are at their premium. Only the healthiest of the crop is harvested at the prime time. By using these methods, we can ensure that only the best seaweed concentrate is produced that promotes superb growth, therefore yield and activity in any plant. The production process does not use any acid, caustic or organic solvent. It is an organic product in the truest sense that has undergone comprehensive trials within the organic growing community. Oceanic has been developed by using a variety of new techniques that ensures that whatever it is used for, from garden lawns to flower beds and crops in greenhouses, it will produce outstanding plant growth activities. To maximize the benefits of liquid kelp, use it as part of a well-balanced plant nutritional program. The concentrate is always further diluted with water (preferably with an approximate pH of 6.0) to the appropriate concentration and applied to foliage or soil. The plant absorbs the extract immediately and is responding by the second day. Always shake or mix Oceanic well before diluting. Only make up what you can use at one time. Our kelp extract can be used with a variety of sprayers — plant misters, pump-up, backpack, hose-end, or tractor sprayers. The dilution rates provided here are based on area measurements. Depending on the type of sprayer you have, simply dilute the product with the appropriate amount of water for your sprayer to cover a specific area. Liquid seaweed also works well with irrigation systems. In lieu of trying to catch specific growth stages, apply the product every 2 to 4 weeks. The solution should be sprayed in the morning or late afternoon when the leaves’ stoma are open. Avoid applying between noon and mid-afternoon when the sun is most intense and the stoma are closed. Also avoid spraying it before it rains or while it is raining. Oceanic has a shelf life of one year when kept from extreme temperatures. Avoid freezing and direct sunlight. Always close the lid tightly. 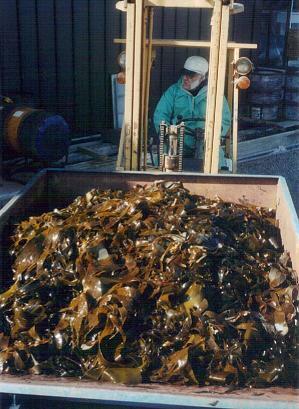 Our kelp concentrate should be used with a mild bio-degradable detergent or a non-ionic surfactant. This will help prevent beading on the foliage and allow more efficient uptake by the seeds, plants, and soil. Avoid harsh detergents, or spreader stickers for pesticides. Add ¼ to ½ teaspoon of detergent per 1 gallon of fully diluted extract. Use manufacturer’s instructions for a surfactant. 1 cap (10 ml) or (2 x teaspoons) of liquid seaweed concentrate will make 6 litres (1.33 gallons) of diluted fertilizer. To make a gallon (4.55 litres) of diluted fertilizer, you will 3/4 of a cap (7.5 ml) or 1.5 teaspoons of the concentrate. 1 cap (10ml) of concentrate added to 6 litres of water will cover approximately 50 square feet. 2 gallons (9 litres) of concentrate added to 5400 litres of water will cover approximately 1 acre. Liquid kelp applied to pasture crops increases the nutrient uptake, the protein content, and overall quality of the crop. Feed: Apply 2 gallon per acre during 4-6 leaf stage, repeated in 10-14 days. Hay: Apply 2 gallon per acre to young re-growth 7-14 days after mowing. Forage: Apply 2 gallon per acre to pastures before animals are set out, and again at monthly intervals, or sooner if stress symptoms appear. Soak the seeds, seed pieces, or bulbs for 5 to 10 seconds with 8 teaspoons diluted in 1 gallon of water. Our kelp concentrate also can be used as a rooting solution. Place cuttings in a solution and water until roots develop, then plant. When planting, water in with the solution. Solution Dilution Rate: 8 teaspoons of liquid seaweed fertilizer to 1 gallon water. 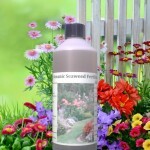 What Does Liquid Seaweed Do For Your Garden? Copyright © 2019 Oceanic Liquid Seaweed Fertilizer. Powered by WordPress. Theme: Spacious by ThemeGrill.